According to Oregon State Police Trooper Jeff Spencer, on June 15, 2010 at approximately 7:00 a.m. a commercial truck pulling two trailers, one of which was loaded with household furnishings and property, was driven by KENNETH NORLUND, age 49, from Salt Lake City, Utah eastbound in a highway construction zone on Interstate 84 near milepost 324 in Oregon. The truck and trailers reportedly drifted to the right onto soft gravel and hit a guardrail, damaging about 140 feet of railing and splitting open the side of the rear trailer spilling its contents. 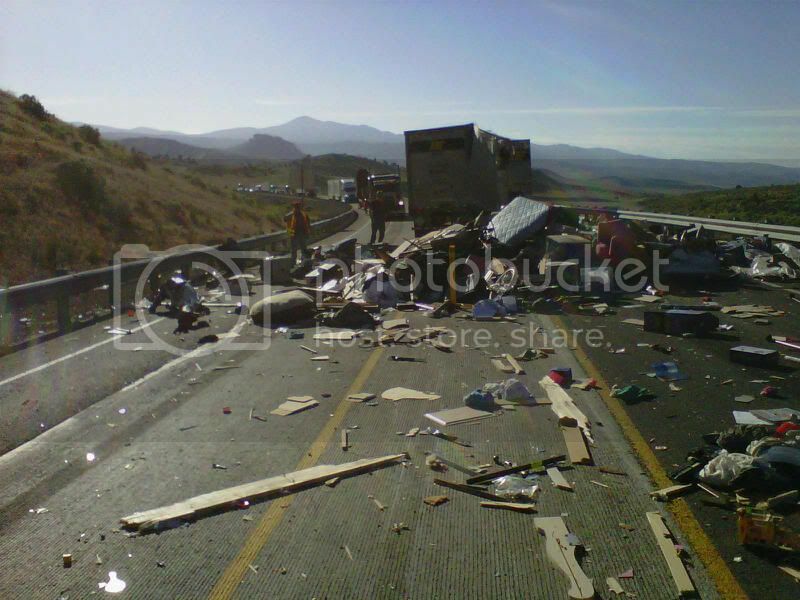 The eastbound lanes were blocked by the spilled contents, damaged guardrail and vehicles. The investigation is continuing into this first crash. ouch! That's one way to get all new stuff. The company sends out little remark cards to people who use the Upack service to fill out on their experience. Do you think this one will be a printable version one from the customer. A Salty Sea version maybe. This is one time I am thankful for lay off. I usually schedule all the upack moves. How do you call this customer and say you might get your stuff but it looks like spaghetti. Do they even have a legal type total of what it is all worth and is it covered for them by insurance? Most of the time any damage is only covered for $.10 per pound. The weight is determined at 448# per foot used. So a full trailer of household goods is really only insured for about $1250. I think in a case like this they would have to cover more. I know we are being sued by a lady whose upack load was sitting in our yard in Nashville and the trailer was under 9 feet of water. So trailer bed is about 4 feet which means her stuff was wet to about 5 feet. She thinks we had the opportunity to get the trailer out before the flooding. Waiting to here the outcome of this lawsuit. Wow. $1250.00. You can see maybe a bedroom set and bikes and it probably goes over $1250..That's not good for them. Maybe they have an "extra-insurance" option. Hopefully they took it.